These are two great recipe requests, and two that every mom should have up her sleeve. You are right on, Tyese. Chicken nuggets and pizza bought in the frozen food aisle, the deli section, or from a fast food restaurant are all extremely unhealthy and can be laden with chemicals, preservatives, and food dyes. Grains and sugar can be the least of your worries when buying a manufactured chicken nugget or pizza! Have you peeked at the ingredients list of one of those packages lately?? At first glance you might say, wow that’s not so bad! But let’s remember where this chicken came from, how it was raised, and how it was butchered. 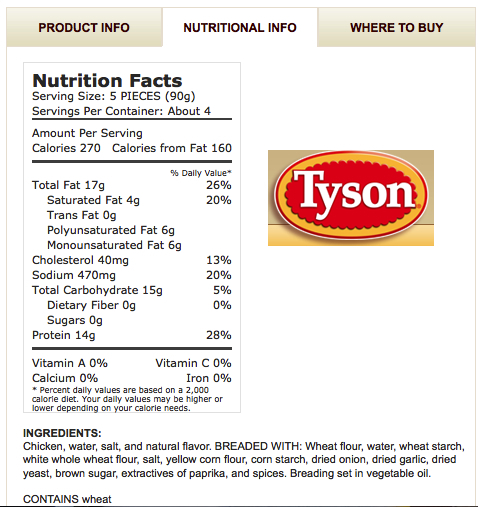 When you hear the brand name “Tyson,” you may remember that they are known for loading their birds with chemicals BEFORE the butchering takes place…probably so they don’t have to post the chemicals on the ingredients label since it’s not added during the manufacturing process? I remember news reports came out about that a few years back, also about the way they treat their animals…. Google it! My point is, this meat is not coming from free range pastured chickens. We don’t know the chemical burden of the meat, which also means the fats are compromised. If we continue to look at the ingredients list, you can see there is a lot of wheat going in (sugar), and corn (sugar), and vegetable oil (bad fat). And look at all the salt! Bad salt, too. It’s not our healthy Himalayan mineral sea salt. And on a label when you see “spices” or sometimes it can read “other flavorings,” that can mean MSG. Who really knows what they are hiding by using a vague term like that. Your kids deserve better! Start with some free range organic chicken and make these nuggets with Advanced Plan ingredients! My recipe is below. I have decided to share this recipe which is originally found in my Kid’s Birthday Party e-Book. Inside, you’ll also find easy Core and Advanced Plan menu options perfect to please your birthday boy or girl and their party guests! 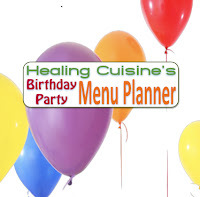 The menu list includes: Almond Crusted Chicken Strips, Sweet Potato Fries, Caramel Apple Slices, Banana Nut Stacks, Chocolate Almond Snack Bars, Very Berry Smoothie, Strawberry Lemonade, Vegetable Art, Vanilla Cupcakes with Chocolate Frosting. 1.) Preheat oven to 475°F. Set a wire rack on a foil-lined baking sheet and brush with coconut oil. Wash and dry chicken breasts. Cut each breast into 6 uniform strips, then cut each strip in half. Use a meat mallet to pound out thick nuggets to each nugget is of uniform thickness. Lay out on a plate and set aside. 2.) Place almond flour, coconut flour, paprika, garlic powder, onion powder, dry mustard, sea salt and pepper in a food processor. Pulse until the the paprika is mixed throughout, about 1 minute. With the motor running, drizzle in the olive oil. Blend until just combined. Transfer the mixture to a shallow dish. 3.) Whisk eggs in a second shallow dish. Add chicken nuggets to eggs and turn to coat. Transfer each nugget to the almond mixture and dredge evenly on all sides. Place the chicken nugget on the prepared rack. Repeat until all chicken nuggets are dredged and on the prepared rack. 4.) Brush each nugget with coconut oil. Flip and coat the other side. Bake the chicken nuggets until golden brown, crispy and no longer pink in the center, 20 to 25 minutes. Serve with organic ketchup and honey mustard. TIP: Prepare in advance: Bake, cool and freeze in an airtight container. Simply remove from freezer and pop, frozen, into oven at 350 degrees F until warmed through. May need to cover with aluminum foil to prevent burning during reheat. Tune in tomorrow for Advanced Plan PIZZA! Thanks for the suggestion! I will definitely play around with the flavours :) What I love about these, besides the taste, is that I can eat 4 and feel very satisfied because of the almond “breading”. I used to make fingers breading with corn flake crumbs and some seasonings. They came out very good but I found that eating a couple wasn’t satisfying enough so I’d keep going back for more (and of course corn is a no-no). Your recipe actually involves less cleanup than the breading and frying method. The fact that this recipe is easy, healthy, and delicious makes it a 5 star one in my opinion and I will definitely be making and freezing some of these to take to university when I go back this fall. Although I try my best, it’s difficult eating healthy in university, mostly because of the fact that you’re constantly busy and when you want food it’s all about convenience. Thanks so much again for this! Any chance you could recommend a good hot sauce to go with this that is approved for the advanced plan? Was hoping you had some recommendations. Ed Currie makes the tastiest and hottest blends I have ever had the pleasure of enjoying! My favorite blends are Shoot That’s Hot, Extra Mean Green, and Yellow Fever.